I use the term home "office" lightly because with our limited space, we don't actually have a separate home office room. My desk is basically in the middle of our living room. One wall is for the sofa and an end table, the other (with the window) is for a pair of chairs, and the third wall is for a bookcase and a desk. During the last half of my Montessori training, I really needed a dedicated home office space to finish up my albums and keep track of all my books, craft supplies, and important documents. We got this table from IKEA, I re-purposed a bathroom organizer basket to hold pens, tape, glue, etc. I bought an "inbox" tray as well as magazine holder from Ross and called it good. It was functional but a total eyesore. It wasn't until this summer when I had the actual time to spruce up our house that I realized I needed to do something about that desk area! How could I have such a messy desk in the middle of our living room!!?? 1. I took out an old cork board I already had that was littered with travel stubs from over the years. I removed all the stubs, put them in a travel stub book I mentioned here, and mounted the board on the wall directly above the desk. I keep it tidy by having just a few sheets of paper including important reminders, inspirational quotes, a postcard, and a to-do list. Cost: FREE! 2. We moved around some furniture in our bedroom to make way for the baby's changing table and sleeping area (NESTING!! ), so one nightstand got moved to the living room and some picture frames were looking for a new home. One made its way to the desk. Cost: FREE! 3. I normally don't like matchy-matchy anything. (I get that from my mom.) Matching sofa, love seat, and recliner? Not my thing. Three-piece bedroom set? Nope. 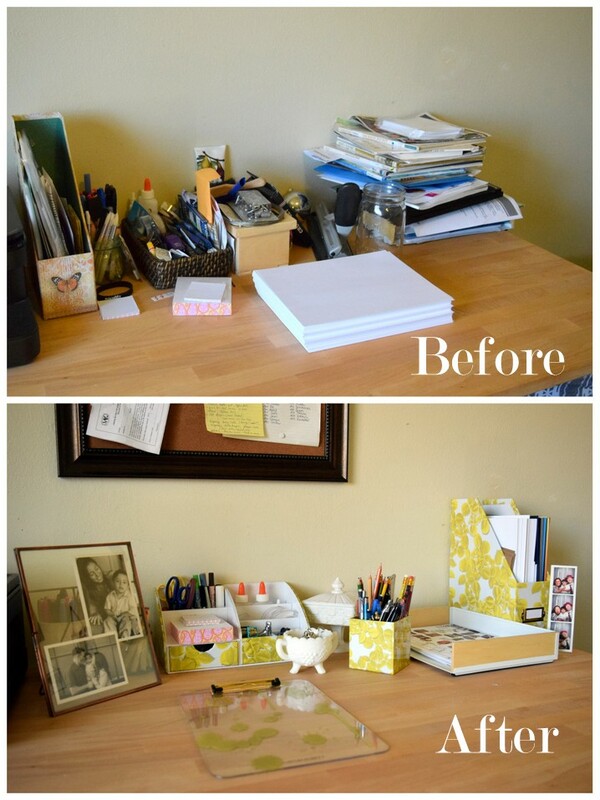 BUT, when I saw this desk accessories set (via Elisa's blog), I thought it looked great! I was not about to spend $40 on a cardboard desk set, but luckily, my local Staples was having an in-store clearance sale on these desk organization pieces by Cynthia Rowley, so I snatched up some items in the yellow floral print: a pencil holder, magazine caddy, organizer, and a clip board. Cost: $18. 4. My dad used to collect milk glass containers. I used to think his collection was a bit much, but now I love them. Sadly, I only kept two containers. They were on our bookcase, sitting there empty, but I moved them to the desk so I could fill them with office supplies. Cost: FREE! 5. In the milk glass container with a lid, I hid rubber bands, paper clips, and push pins. In the open container, I wanted to store some colorful binder clips, so I bought some from the same Cynthia Rowley line as well as some colorful pencils for the pencil holder. Cost: $2.